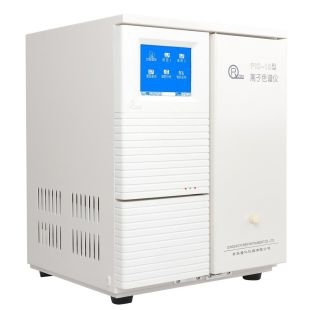 Abstract: An ion chromatography - voltammetry (single potential) method by using China instrumentwas developed for the rapid determination of iodide (I-) and thiocyanate (SCN-) with detection limits: 1.9 mg/L , 4.7 mg/L, reproducibility (RSD %, n = 3): 1.12% , 1.58%, accuracy (recovery): 98.3%, 93.6% respectively. 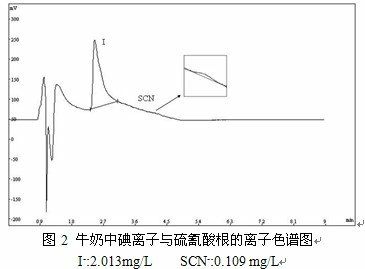 The concentration (I-): 2.013mg/L, (SCN-): 0.109mg/Lin milk were detected in 5minutes. The method showed higher sensitivity, better accuracy and shorter analytical period, and would be applied to milk routine analysis. 1.张小乐, 闫., 张一江, 等, 环境与健康杂质, 2007. 24(11): p. 910. 2.张贵珠, 张., 郭薇,等, 分析科学学报, 1994. 10(3): p. 52. 4.姜华, 周., 王玉宝, 分析测试学报, 2004. 23(5): p. 130. 7.林立, 王., 韩春霞, 离子色谱法测定液态奶中的硫氰酸根. 技术*食品工程, 2010: p. 156-158. 8.帕提曼*卡吾力, 古.木., 贾新建离子色谱法测定牛奶中的硫氰酸根离子. 饲料工业, 2011. 32(19): p. 43-44. 9.叶明立, 胡., 潘广文, 毛细管离子色谱法同时测定饮用水中的碘离子、硫氰酸根和草甘膦. Chinese Journal of Analytical Chemistry, 2011. 11(39): p. 1762-1765. 10.史乃捷, 王., 李海峰, 离子色谱法检测奶粉和液态奶中的硫氰酸根. Chinese Journal of Analysis Laboratory, 2009. 28 supply: p. 150-153. 11.李静, 王., 梁立娜, 混合模式色谱柱离子色谱法同时测定奶粉中的碘离子和硫氰酸根. 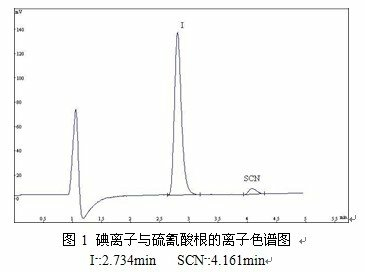 Chinese Journal of Chromatograph, 2010. 28(4): p. 422-425. 12.李静, 王., 梁立娜, 离子色谱法同时分析奶粉中的碘离子和硫氰酸根. Chinese Journal of Analysis Laboratory, 2010. 29(5): p. 17-20. 13.武婷, 郝., 离子色谱法测定牛奶中的硫氰酸根. Chinese Journal of Analysis Laboratory, 2009. 28 supply: p. 206-208.